Automation Testing: Test automation framework, AccuRate, Single script for multiple platforms & devices, Test execution, test control & test management, Supports open source tools (Appium, Protractor, Selenium etc. API/Web Service Testing: API/Web Service test automation framework using open source tools, Tool expertise: SOAP UI, jMeter, Charles Proxy, Fiddler etc. 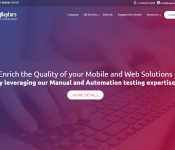 AccuRate is our one-stop solution for test automation across various mobile platforms (iOS, Android, Web) and desktop browsers, in real-time. It provides rich features for test execution, test control and test management with data-driven and keyword-driven testing capabilities for zero code scripting. AccuRate includes 600+ pre-built functions for mobile and web automations leveraging Appium, Selenium and Protractor. 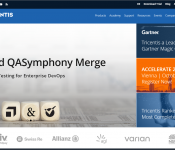 RapidValue has been featured in Gartner’s Market Guide for Mobile Applications Testing 2015 as one of the representative vendors in mobile testing app services. RapidValue delivers its services to the world’s top brands, Multinational companies and Fortune 1000 firms, and has offices in the United States, United Kingdom and India. Key customers include Facebook, Yahoo, LinkedIn, eBay, Citrix etc. 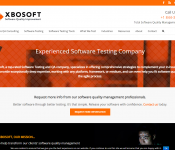 Why RapidValue for software testing?